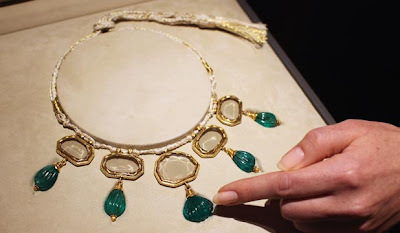 A "Mirror Diamond" necklace bearing five Mughal empire pendant diamonds with emerald drops has been offered for private sale at a price of US$20 million (NZ$24.4m), auction house Bonham's has revealed. It said the Mughal Mirror Diamond necklace was an extraordinary example of the colourless, rough diamonds discovered in the ancient Golconda mines in India during the height of the Mughal empire across the Indian Subcontinent in the 16th and 17th centuries, which were reserved for royalty. At 28 carats, the central stone is the largest mirror or table-cut diamond known to survive, and the five diamonds (ranging from 16 to 28 carats) are the largest known matching set of table-cut diamonds from the Mughal 17th century. It is most likely that the diamonds belonged to a Mughal emperor. "The presentation of the Mughal Mirror Diamond necklace, containing five extraordinarily well matched mirror diamonds, is causing great excitement in the world of jewellery scholars as well as potential buyers," Bonhams CEO and International Head of Jewellery Matthew Girling said in a statement. To both Mughal emperors and Indian maharajas, the quality and size of the gem were of paramount importance, and table-cut diamonds were valued for their clarity and size above all else. At the time, gem-cutters only sought to remove areas with cracks and inclusions, so the shape of the rough gem determined the final outline of the polished stone. As a result, gems had an irregular and asymmetrical form as the cutter was striving for the maximum size possible. Weighing approximately 96 carats in total, the skilfully rendered table-cut diamonds were designed to emphasise the beauty of the stones without sacrificing their size. The table-cut description refers to a thin diamond section with a flat top and bottom, where the diamonds have also been faceted around the edge. This faceting acts as a border around the irregular shape of the diamond, to produce a refractive brilliance. The GIA (Gemological Institute of America) has speculated that the five near colourless diamonds were cut from the same crystal.The Columbian emerald drops were added at a later date, probably late 18th/early 19th century. Pendants such as the necklace were an important element of Mughal jewellery and were used as turban ornaments and armbands. Many of India's royal pieces of jewellery were subjected to the 19th and early 20th century fashion for replacing and recycling old jewels with new, Western settings or re-cutting into brilliant diamonds. And as the Mughal Empire weakened and collapsed, many of the royal jewel collections were dissipated or lost.